Want to become a professional truck driver? Not sure where to start? We’re about to tell you how to find the best trucking school to get CDL training. AND we’re going to offer some very important things to consider so you know there’s a truck driving job opportunity available after training. After all, what good is the training if you don’t have a job? A new truck driver’s skills are only as good as the training received. Look for a state-licensed program with experienced, professional instructors. It’s important to find a reputable school that combines classroom knowledge with hands-on, behind-the-wheel training learned on the range and road. The whole point in getting a CDL is to make some cash, right? The best truck driving schools help drivers find a great paying job opportunity BEFORE CDL training even begins. Trust us, that sure beats putting in all the hard work to get a CDL but having no job. Most people aren’t able to shell out $6,000 cash for CDL training. Find a program that offers a CDL training sponsorship or a free CDL training program (don’t pay a dime when you drive with the company for 1 year) to make learning the skills you need easily affordable. If you come across a trucking school promising a CDL in a week or so, run far away. Learning to drive an 80,000 lbs tractor-trailer safely takes some time. The best, most reputable truck driving schools typically last around 3-4 weeks. The biggest things to stress here is that the best truck driving school may not be down the road. In fact, the cheapest, closest and most convenient school might not even be a good option. If that’s the case, just think of traveling to school as the first road trip on the journey to becoming a truck driver. Ready for more information on finding the best trucking school? 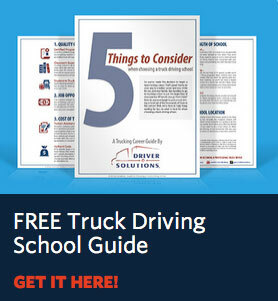 Driver Solutions has put together a free guide covering the topics above in more detail. It’s a quick read and one that will be extremely valuable in starting a new career as a professional truck driver.